If we are close to Our Blessed Mother we are close to Jesus and we will not go astray. We are so blessed to have numerous shrines and statues in the world of Our Blessed Mother who has appeared many times during this last century. She reminds us of the importance of faith and calls us to prayer, penance and intercedes for us in a very special way because she is the Mother of God and the mother is very close to her Son. The Son does not refuse any request of His mother. The appearance of the Angel of Peace to three little Portuguese shepherds was a preparation to help them to pray. 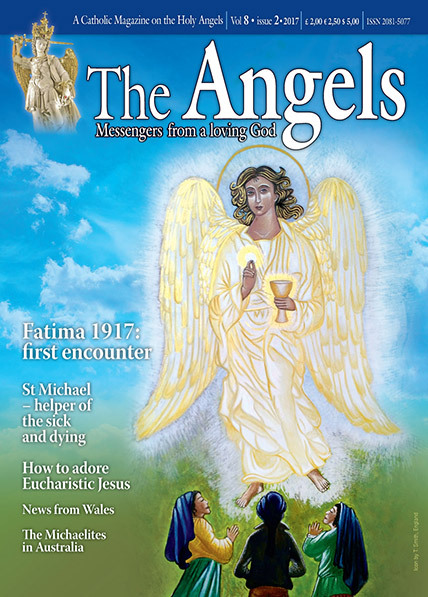 Angels are messengers from a loving God, we should call on them often asking for their intercession and to pray with them. To those who faithfully follow Our Lady’s requests for the Five First Saturdays: Go to confession, receive Holy Communion, recite five decades of the Rosary, and keep Our Lady company for 15 minutes while meditating on the 15 Mysteries of the Rosary, with the intention of making reparation to Her. As Mediatrix of All Graces Our Lady has made a wonderful promise: “I promise to assist at the hour of death with the graces necessary for salvation.” Meaning that our Blessed Mother will be present at the hour of death with the actual grace of final perseverance, (which after the gift/grace of Faith), is the most important grace. To mark the centenary celebrations of the apparitions of Our Lady of Fatima in Portugal, Pope Francis has decided to grant a plenary indulgence opportunity throughout the entire anniversary year, from 27th of November 2016 till the 26th of November 2017. There are three ways of obtaining the indulgence. However, the faithful must participate in a celebration or prayer. Say the Our Father, recite the Creed, and invoke the Mother of God during the days of the anniversary of the apparitions, the 13th of each month from May to October 2017. Pilgrimage to the Fatima Shrine in Portugal. Pray before any statue of Our Lady of Fatima. The elderly and infirm can pray in front of a statue of Our Lady of Fatima offering their sufferings or the sacrifices they make in their own lives. Pray each day to St Michael, your guardian angel and to Our Blessed Mother who is ever teaching us how to pray and live for God.